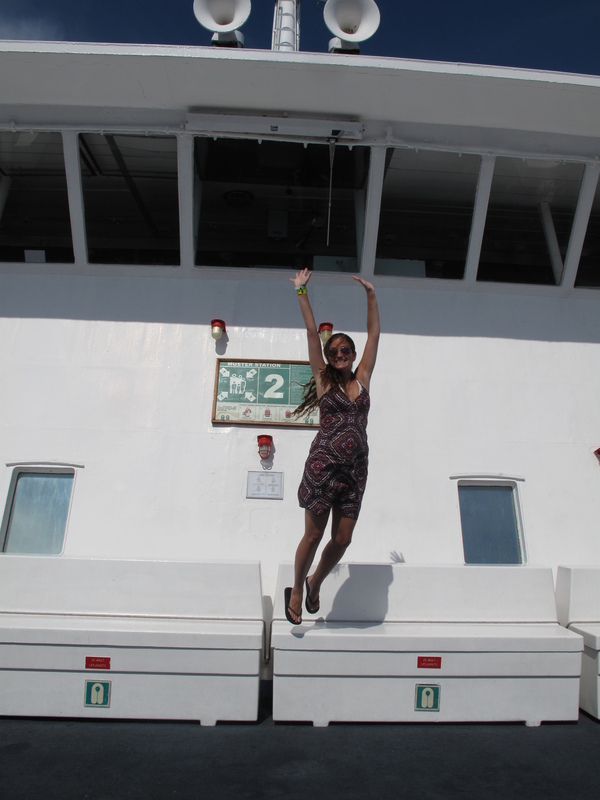 What can be more exciting than a Day Cruise to the Bahamas? During our visit to Florida, Darren and I hopped on Discovery Cruise Line and headed for the pristine sands of the Bahamian beaches that are softly caressed by the aqua waters of the North Atlantic Ocean. Our cruise included two all-you-can-eat buffet meals, a swimming pool and sundecks, entertainment including music and a video disc jockey, cruise bingo, movies, games, bars, clubs, a video arcade, dancing, live music, cruise shows and contests, a casino with slots, Craps, Blackjack & Roulette, and did I mention all-inclusive drinks? 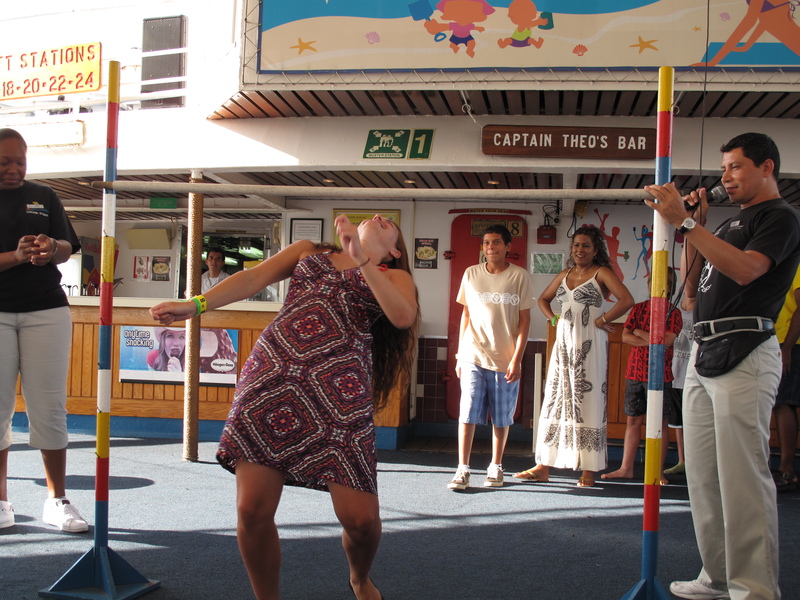 We may have enjoyed the outdoors on the sun decks, took a dip in the pool, and ate a hearty breakfast, but it was the all-inclusive drinks that encouraged me to participate in a limbo contest at 9am, a dance contest with Darren on the main deck at 10am, and a “photo shoot” at 12pm. 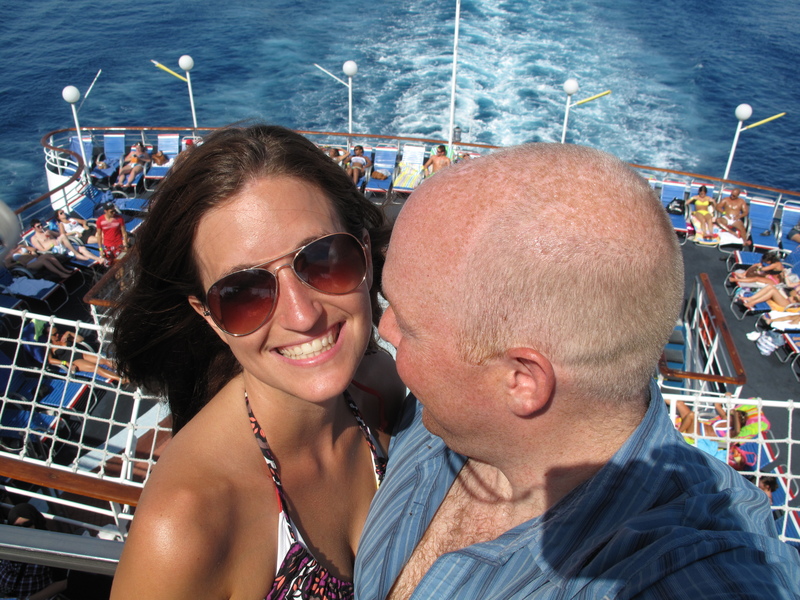 Our cheap, Discovery Cruise ended up being one of the most memorable days of our lives together. Last call for boarding was at 7am and if you know me, that means I like to be there at least two hours early to make sure we don’t have problems in the line or issues with being late. We first stepped on the ship at 6:15am and breakfast wasn’t being served until 8am. What could we possibly do from 6:15-8? 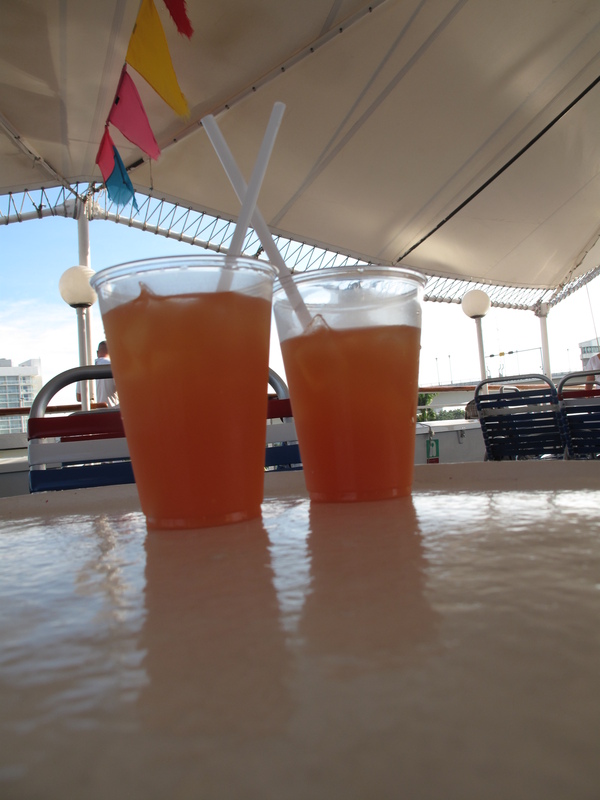 After doing a quick tour of the boat we realized that the main sundeck was already handing out drinks like Halloween candy so we took advantage of the “drunk-all-day” option that is usually only supported by young, college students. Our 8am breakfast was washed down with several “Brilliant Sunset” drinks, orange juice, orange, maraschino cherries, grenadine, vodka, and ice. 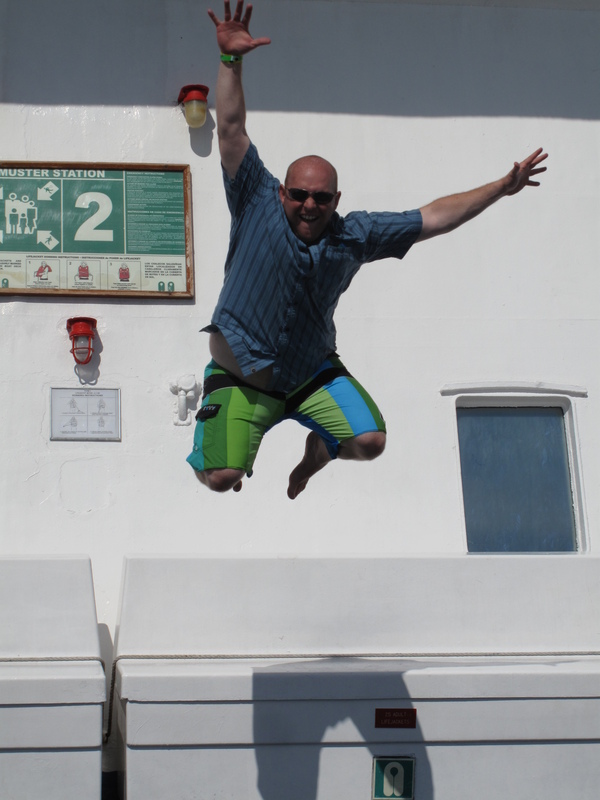 Then, we found our way back to the main deck because the limbo was about to begin and I had liquid courage. I was surprised when Darren said he didn’t want to participate but I happily just asked him to take pictures as I made my way to the back of the line. Let me just say that several morning drinks and a dress do not equal good limbo skills. I was back to the table 4 rounds later and we laughed about my inability to get down while trying not to flash everyone on the deck. I had my bikini on under my dress but I opted for the more classy limbo version in a dress. Bingo followed the limbo and was too tame for our liking. We took that time to fully explore the ship and our options. 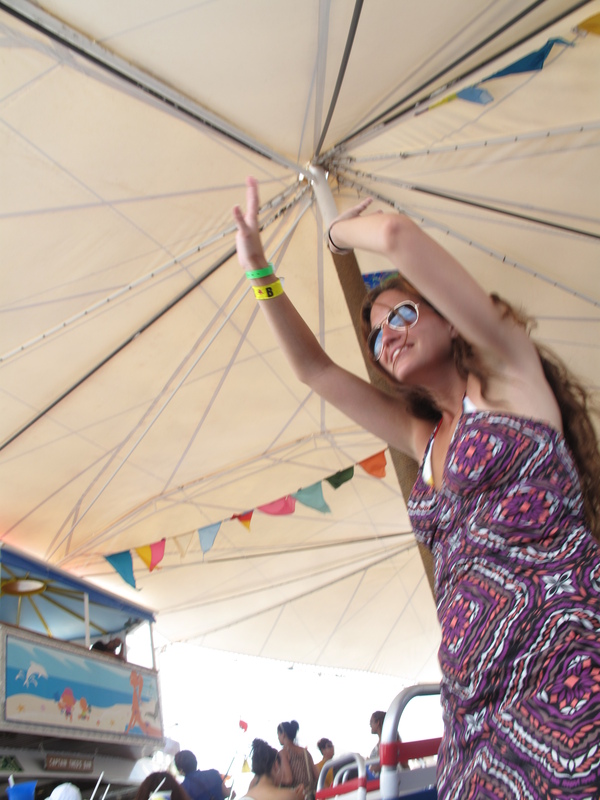 Little did we know that there was another, equally large, deck serving drinks and having a dance party. Initially, we didn’t join in the crowd. We found seats off the the side and became onlookers, but the same courage I exhibited to participate in the limbo encouraged Darren to break out his best moves for me. he didn’t bother to join the others on what was a clearly marked dance floor. Nope! Not required I guess. Instead, he brought his best moves out where he was actually way more obvious and noticeable. We took turns showing our best moves and taking pictures, completely oblivious to anyone else around us. We had always had fun together but this was the adventurous, free-spirited Darren that I knew existed and I laughed harder than ever before. 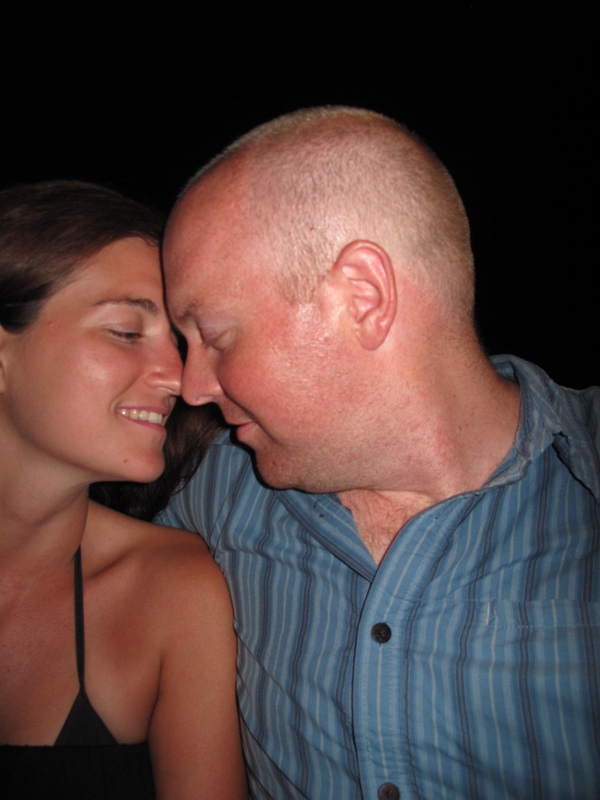 It was most likely a combination of drinks, not knowing anyone, and being comfortable around each other that encouraged his new found freedom but I knew I had found my perfect match and we would have a lifetime of fun together. 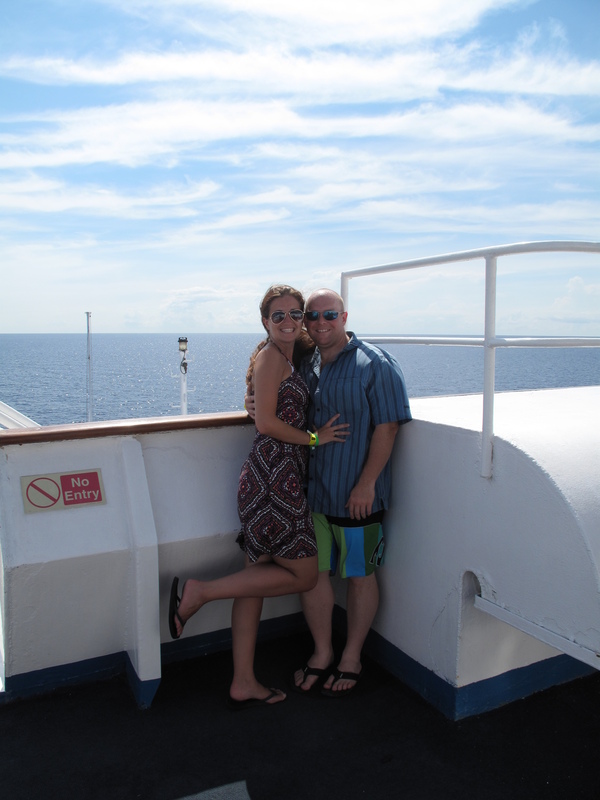 Exhausted from dancing, we made our way to the bow of the ship where the breeze would be the strongest. Several, hilarious, jumping-action shots were taken before we actually took a break and enjoyed the views of the ocean while listening to the waves crash below. We were about to set foot on new land and discover a new place, but I was quite content right where I was. It wasn’t the actual time spent in the Bahamas that made my day perfect; it was the new memories we made with each other that will last a lifetime. This entry was posted in Bahamas, Caribbean, Travel, Uncategorized, vacation and tagged Adrenaline, adventure, Bahamas, bucket list, Bucket List Publications, Caribbean, Cruise, culture, Discovery Cruise, Family, Getaways, landscape, Lesley Carter, life, love, photo, photography, travel, vacation by lesleycarter. Bookmark the permalink. hehe. u look very happy there. in the grasp of cold here still, i can only envy those hours there. We had a blast! I’d go again in a heart beat. You really look so cute together! Looks like you have really found each other! I found a man that is beyond my dreams. He makes each day exciting and new. Enjoyed the read.. Seeing this brings back memories of Djing for Disney Cruise lines. Woo hoo! You the original party animal!! You guys look like you had a blast! Thanks for sharing. 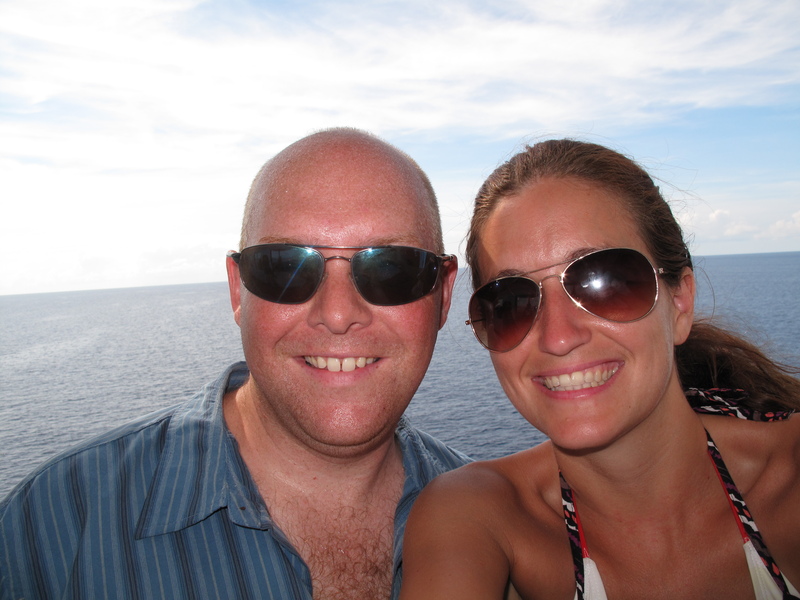 The Bahamas are probably at the very top of the bucket list hubby & I are making – how awesome for you to have a quick jaunt there! : ) These photos are fantastic and you look so very happy… it’s fantastic that you both feel free enough with eachother to have that kind of joyful fun together. It’s truly the very best kind. What a fun post! Such a great reminder that life is best when one releases their inhibitions and just LIVES! YAY! Thanks for sharing your always-delightful stories! U-hoo. Have fun you guys. I live vicariously through your blog and lovely pictures. Looking @ the pics and reading I had a nice “vacation ride”. 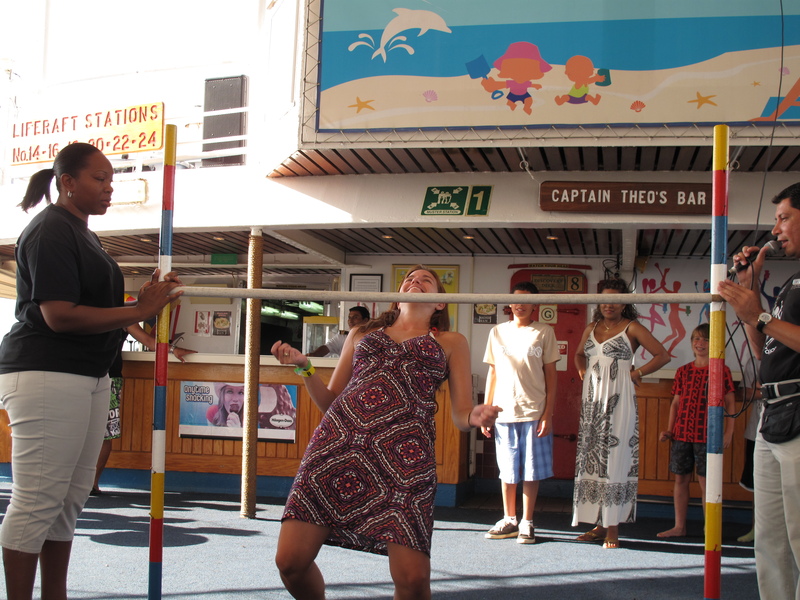 I wouldn’t mind having some fun on a Cruise ship. Looks like so much fun! I need a vacation! Love the photos, sounds like you guys made some fantastic memories! What a great time! The pictures sure look like you were having fun. Especially the Limbo dance. Those pics and your post brought a shaft of sunshine and heat into a chilly February day. Thank you! Today, in SoCal, it is 83 degrees. With sunshine and heat, I’m reminded of my beautiful decision to move here. Although I miss my family beyond words, I don’t miss the cold weather and the snow. Lesley, if any couple knows how to make the word “Party” proud of itself, it is you and Darren! So pleased you guys could get some much deserved rest and sun and fun! Looks liek you had so much fun Lesley. Bahamas is beautiful! I went there for my honeymoon. Oh how this brings back memories of the bahamas and their “rum punch” – it makes it just a bit more fun – oh heck, a whole lot of fun. 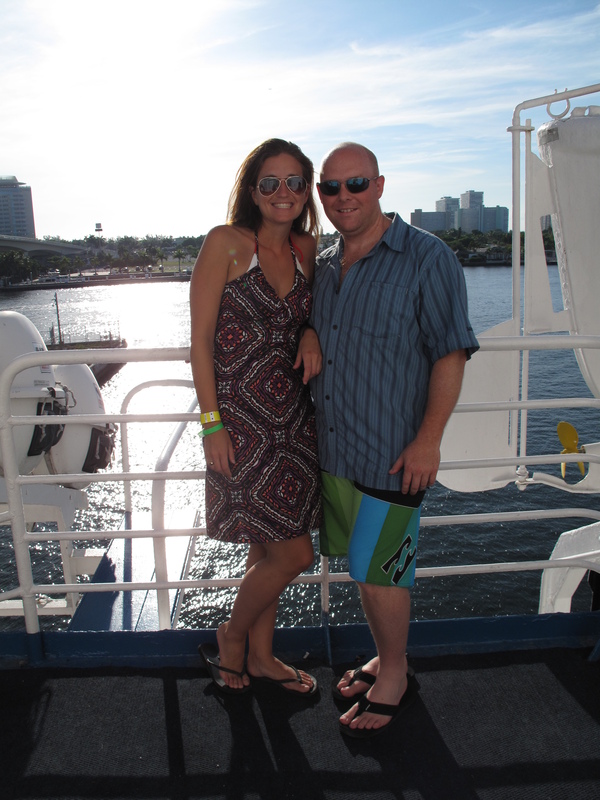 We rented a catamaran when our cruise was docked at the bahamas. 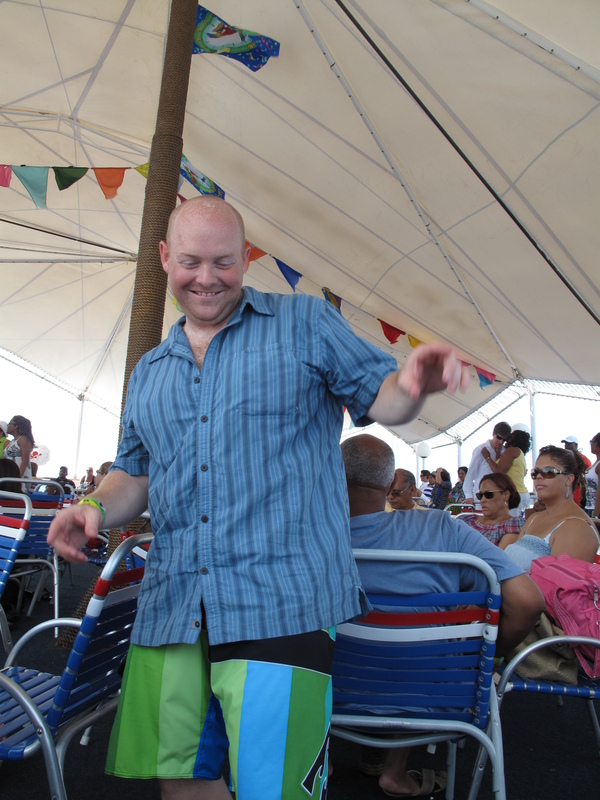 Yep, first thing out was the rum punch and we had a blast! It was a day filled with swimming, snorkeling and just hanging out. Thanks for these pictures and the memory of our day drinking rum punch from 9am-?? These are such cute pics! Although we’ve had a warm-ish winter here, it makes me want to head south and do the limbo. Thanks for sharing. It is always great to think about such a wonderful getaway. Looks like you had a blast! Would it be shallow of me to say that I love your dress? Want. Grew up in Florida and the Bahamas (often Bimini) were the ‘go to’ place as a kid on our family vacations. 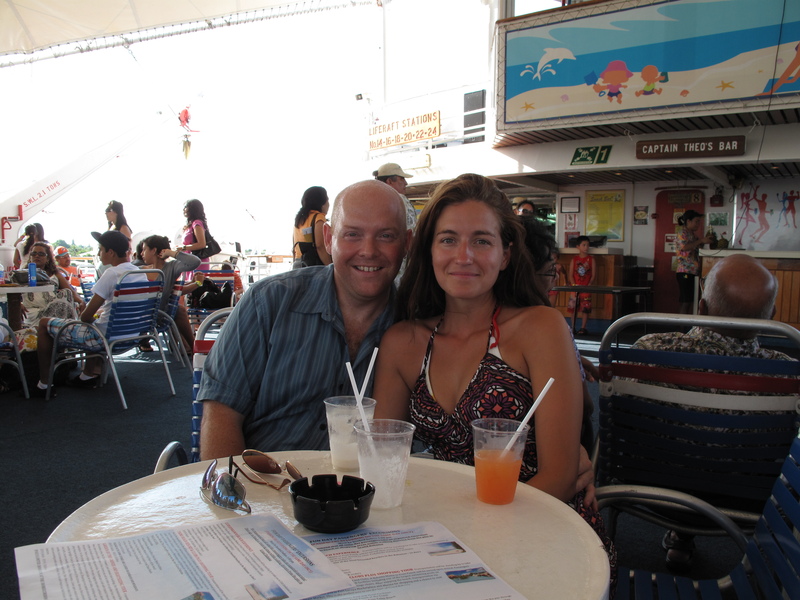 Twas many years ago… I think a day trip is a perfect way to get a taste of a cruise and the Bahamas. Glad you stopped by chez chloe again. 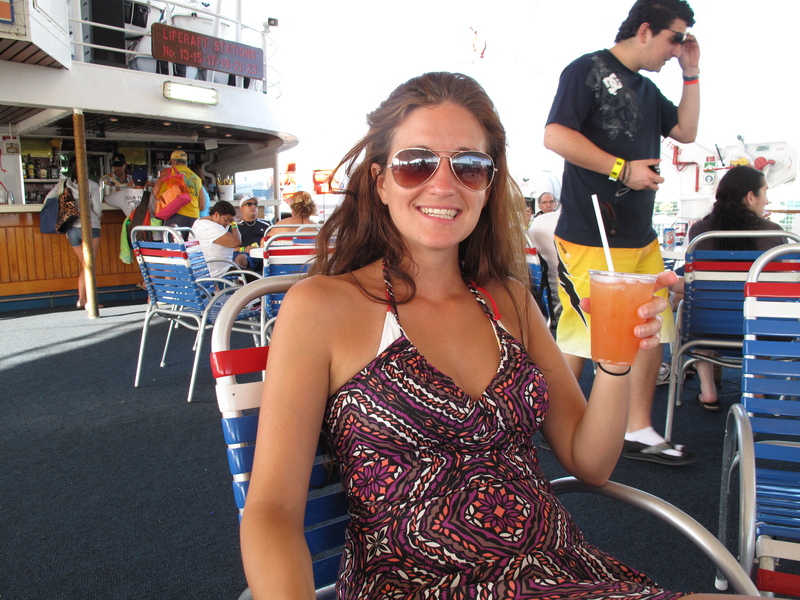 Looks so fun… U make that drink look good girl! Love your crazy, zany, playful antics! Two peas in a pod you are. Thank you! We really are a good match 🙂 I can be myself around him and he encourages my adventurous spirit. I feel blessed. Ah, such a sweet pictures!! What a great blog! Love it keep it up! you guys look extraordinarily happy! keep it up! 😀 p.s. : i bet it was a real journey!! I’ve done that cruise before too, but it was chilly, so we tried to stay inside as much as possible. On the way back it wasn’t quite as cool out, and we had a great time. But we had three kids with us, so we had to be tame. Besides, I don’t remember them offering free drinks then. But this was in like…2007 or 2008 maybe? I don’t remember. It was fun though.